Oil prices jumped by more than one percent in early trading on Thursday as a huge wildfire in Canada disrupted its oil sands production, while escalating fighting in Libya threatened the North African nation's output. International benchmark Brent crude futures were trading at $45.31 per barrel at 0031 GMT, up 69 cents or 1.6 per cent from their last close. 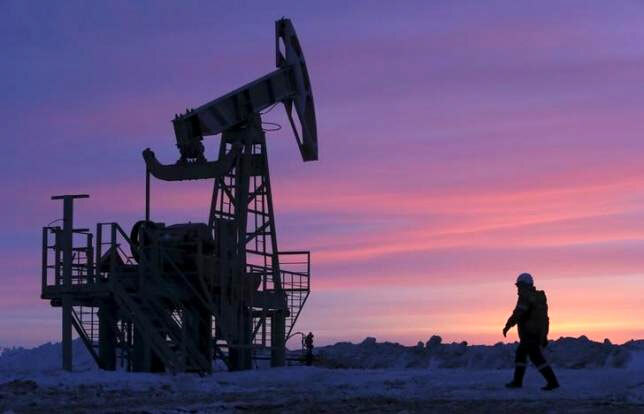 US West Texas Intermediate (WTI) crude futures rose 75 cents, or 1.7 per cent, to $44.53. Traders said that WTI prices were driven up by an uncontrolled wildfire in Canada that disrupted oil production in the province of Alberta. A massive wildfire has forced the evacuation of all 88,000 people in the western Canadian oil city of Fort McMurray and burned down 1,600 structures, and has the potential to destroy much of the town, authorities said on Wednesday. With evacuees being told to head north towards Alberta's oil sands fields, production at several facilities has been disrupted, although the decline in output was unclear. Brent was pushed higher by escalating fighting in Libya. Libya's already crippled oil production is at risk of further decline from a stand-off between rival eastern and western political factions, which prevented a cargo belonging to trading giant Glencore from loading. A Tripoli-based oil official warned the country's oil output could fall by 120,000 barrels-per-day (bpd) if the Benghazi-based National Oil Corporation (NOC), set up by the rival eastern government, continues to block tankers loading for Tripoli from the eastern Marsa el-Hariga port. Investment firm ETF Securities said that unplanned outages within the Organization of the Petroleum Exporting Countries (OPEC), of which Libya is a member, stood above 2 million bpd, the highest in at least five years. Beyond these disruptions, ETF Securities said market fundamentals were also turning bullish. "Investor optimism for oil has markedly improved. We believe the gains in price are sustainable and not just driven by speculative gains. We are likely to be in a global oil supply deficit by Q3 2016," said Nitesh Shah, director of commodity strategy at ETF Securities.